Just finished a weekend show at the Contemporary Crafts Market in Pasadena. Thank you, thank you, thank you to all the people that came by and visited my booth. It was a terrific show and the support you give made so much to me. This is the second show in Pasadena for CCM after moving from their Santa Monica home. If you missed the chance to see the show, they will have another one in November. Hope to see you there! I often get asked this when exhibiting at jewelry shows, "How can I carefully clean my gemstone jewelry"? Sterling silver tarnishes over time and on occasion you need to clean it. This task can be a bit more challenging when there are semi-precious gemstones attached. I often use a polishing cloth to throughly clean the sterling silver jewelry. I use separate cloths for cleaning argentium sterling silver and standard sterling silver jewelry. A few tips I recommend are to clean your jewelry often. You can use warm water with a mild phosphate free detergent. Avoid using rubber gloves as they can be corrosive to silver. Dry the the jewelry promptly. You can lightly buff it with a soft cloth or a polishing agent. Birthstones are gemstones that symbolizes a month of birth. I have made custom birthstone jewelry for mothers, sisters, spouses and friends. It's a unique way to let someone know how much you care about them. Please contact me if you would like to customize your jewelry with a birthstone. I'd love to hear from you! Argentium Sterling Silver Jewelry is highly tarnish resistant. Since it is made to a higher standard than traditional sterling silver, Argentium Sterling Silver is guaranteed to be not less than 92.5% pure. The tarnish resistance is obtained through the alloying of Germanium with the silver. The result is a highly tarnish resistant material that does not require harsh chemicals to clean. If it needs cleaning it can be wiped with a soft cloth to restore the original sparkling white color. Do not use a cloth that has tarnish from conventional sterling silver as the tarnish might contaminate the Argentium Silver. It can also be washed with soap and water. "How did you come up with that idea for a design"? This is a common question asked to many artists. Like all good ideas, it starts with pencil, paper and a lot of quiet time. I draw on my experience as a graphic designer to assist in conceptualizing my latest jewelry creations. It's exciting to see each piece take shape. I will heat, hammer and shape metal until I achieve the desired outcome. 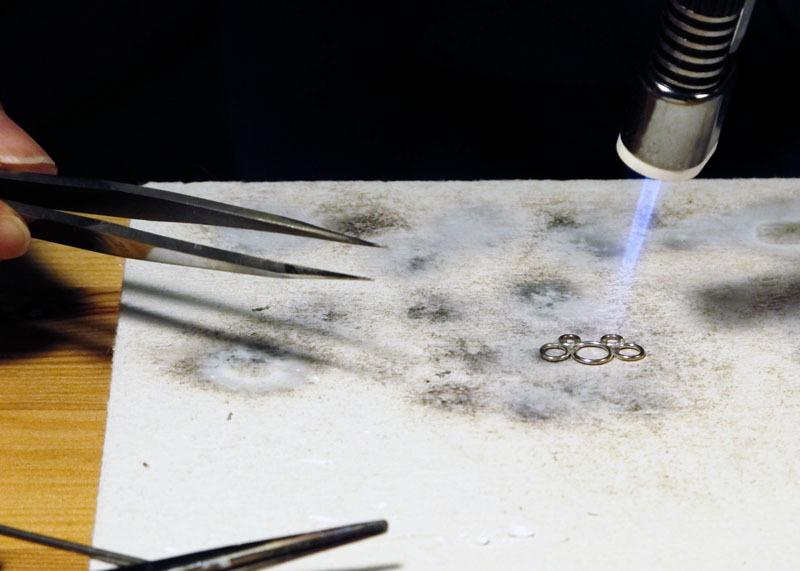 This image shows me soldering sterling silver circles together. Each circle is individually shaped from a spool of sterling silver wire.